HONG KONG, Oct 13, 2018 - (ACN Newswire) - The 38th HKTDC Hong Kong Electronics Fair (Autumn Edition), organised by the Hong Kong Trade Development Council (HKTDC), and the 22nd electronicAsia, jointly organised by the HKTDC and MMI Asia Pte Ltd, opened today at the Hong Kong Convention and Exhibition Centre (HKCEC) and continue until 16 Oct. As the world's largest electronics marketplace, this year's Autumn Electronics Fair and electronicAsia together host more than 4,300 exhibitors from 25 countries and regions. The HKTDC has organised more than 140 buying missions, representing over 14,000 buyers from 64 countries and regions to the two fairs. These missions include major international retailers, importers and distributors such as eBay from the United States, Canadian Tire Corporation from Canada, Dixons Carphone from the United Kingdom, Hama from Germany, CAP Distribution from France, Absolut Group from Russia, Multilaser from Brazil, Tmall from the Chinese mainland, Reliance Retail from India and Fabtronics from Singapore, creating more business opportunities for exhibitors. 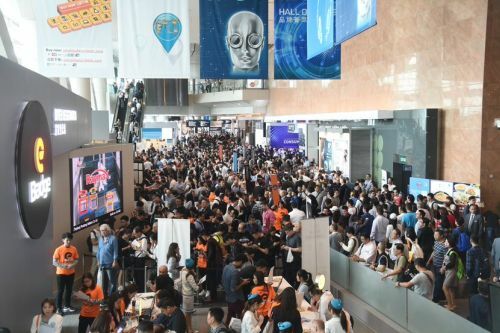 "The two fairs spotlight the industry's latest innovative products and technologies such as artificial intelligence (AI), the Internet of Things (IoT), robotics, power supply and sensor technologies, providing an ideal trading platform for the exhibitors and buyers," said Benjamin Chau, Acting Executive Director, HKTDC. "Many events are also organised to facilitate industry exchange, including today's Symposium on Innovation & Technology, where representatives from tech giants such as Microsoft, IBM and SenseTime shared their insights on business opportunities under the theme 'AI Empowerment - Grow without Limits'. The symposium helped the industry grasp the latest market information to enhance business in the face of global economic uncertainty." The Hall of Fame, a highlight of the Autumn Electronics Fair, gathers the latest electronic products from more than 560 top international brands - including Italy's LAICA, the UK's Binatone and the Netherlands' Bourgini - as well as local brands Goodway and VTech. Other zones include i-World showcasing smart device accessories, Wearable Electronics, Audio Visual Products and Electronic Gaming. There are also group pavilions from the mainland, Korea and Taiwan, including Ningbo city in Zhejiang province which brings its electronics products and technology to the fair for the first time. The Tech Hall, located at the Convention Hall, features five thematic zones to facilitate the sourcing of high-tech electronic products, including the Startup, Virtual Reality (VR), Smart Tech, Robotics & Unmanned Tech and 3D Printing zones. Exhibits include mainland exhibitor Tuya's latest smart home products (Booth: CH-H04), local exhibitor Roborn Dynamics' robotic arm which can handle high-risk tasks (Booth: CH-B01) and a smart underwater robot developed by a Shenzhen exhibitor that can hover within a precise range of 2-3cm (Booth: CH-P07). The Tech Hall features the Startup zone, gathering 110 start-ups from Hong Kong, the mainland, Denmark, Japan, Korea, Taiwan and the US. 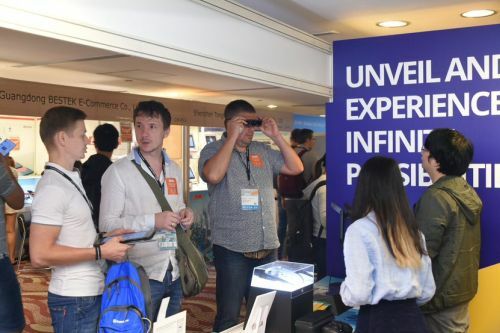 They introduce the latest innovations such as apps, smart-home solutions, wearable tech, IoT appliances, big data and electronic healthcare products and technologies. Featured products include an award-winning smart wireless charger from US exhibitor Gogotoro LLC (Booth: CH-F07), an infrared projection virtual keyboard by Taiwanese exhibitor Serafim Technologies Inc. (Booth: CH-G05), multifunctional helmet gear Headsup (Booth: CH-D01) and a smart temperature-humidity sensor (Booth: CH-F04) developed by local start-ups. To support start-up development, the fair features a series of start-up-themed events to provide a platform where entrepreneurs can meet potential partners and exchange market information. Today's events included a seminar providing tips for digital business banking (organised by Hang Seng Commercial Banking) and Media Pitch Day for start-ups to promote solutions and products to media. Start-ups also obtained valuable advice on business development at the Meet the Mentors session. Representatives from the Angel Investment Foundation, BraveSoldier Venture Capital and well-known technology and business media platform Techsauce from Thailand will share their insights on marketing, crowdfunding and success cases at other start-up events. Startup Smart Launch sessions are held during the fair for start-ups to promote their solutions and products to investors and buyers. Events to take place on Monday (15 Oct) include the Value Creation for Technology: Investment Pitching Competition, the Investment Matchmaking session featuring one-on-one meetings between start-ups and investors, as well as a start-up networking event (organised by Hang Seng Commercial Banking). To help industry players grasp the latest market information, the fair is hosting a series of forums and seminars, including today's Symposium on Innovation & Technology, co-organised by the HKTDC and the Hong Kong Electronics & Technologies Association, where Nicolas Yang, Secretary for Innovation and Technology, Hong Kong Special Administrative Region, delivered the opening speech. Under the theme "AI Empowerment - Grow without Limits", the symposium featured heavyweight speakers including Garrick Ng, Chief Technology Officer, Cisco Hong Kong, Macau and Taiwan; Vincent Wong, Associate Director, Consulting, Deloitte China; David Chow, Partner and General Manager, Global Business Services, IBM Hong Kong; Winnie Chu, Cloud and Enterprise Business Group Lead, Microsoft Hong Kong Ltd.; and Jessie Lin, Vice President, SenseTime. They discussed AI development trends through case studies as well as challenges and opportunities in such fields as Internet security, machine learning, product design and applications. Held concurrently with the Autumn Electronics Fair, electronicAsia creates an unrivalled sourcing platform for electronic components and production technologies. The Power Supplies spotlight zone presents various battery types, including electric car batteries, power supply accessories as well as solar photovoltaic components and technologies. Other featured exhibits include printed circuit boards and electronic manufacturing services (EMS), display technology, keyboards and switches, as well as sensor technologies used in automation systems. To match buyer demand, there will be a Sensor Technology Forum tomorrow (14 Oct) where professors from Darmstadt University and Ernst Abbe University for Applied Sciences Jena in Germany, as well as a representative from start-up magazine NKF Media, will examine sensor applications in IoT, blockchain, mobile quality assurance and vehicles. At the Hong Kong Electronic Forum on 15 Oct, a professor from the University of Maryland in the US and a representative from Singaporean electronic component testing company Viscom Machine Vision will discuss AI enhanced reliability and functional safety for electronic products. Other seminars include "3D Printing: Now and Beyond" (15 Oct) and "Symposium on Innovation & Technology - Technologies & Success Applications in An Age Of AI" (16 Oct). There are also buyer forums, product demos and launch pad sessions, as well as networking events for the industry to exchange information on the latest market trends and establish business connections. 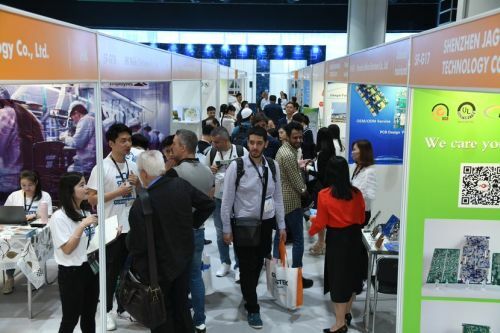 Visitors throng this year's Hong Kong Electronics Fair (Autumn Edition) and electronicAsia, which feature more than 4,300 exhibitors from 25 countries and regions, forming the world's largest electronics marketplace. The Hall of Fame at the Autumn Electronics Fair showcases the latest products from more than 560 top international brands. The Tech Hall at the Autumn Electronics Fair spotlights high-tech thematic zones including Startup, Virtual Reality (VR), Robotics & Unmanned Tech, Smart Tech and 3D Printing.